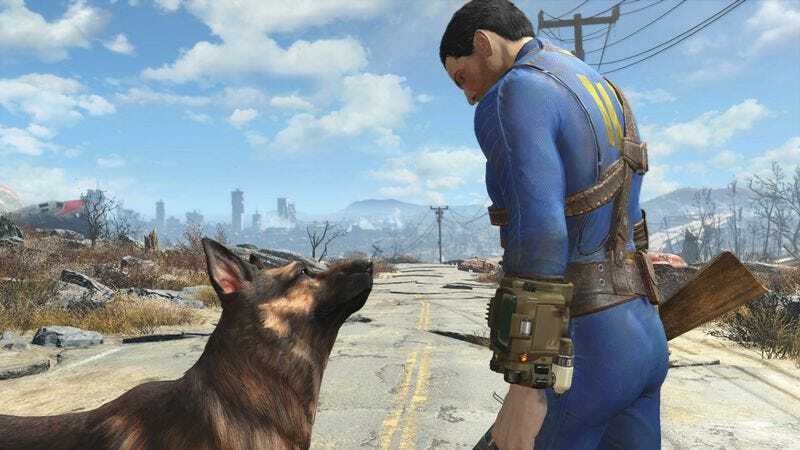 What’s your favorite Fallout 4 experience so far? One of the best things about games like Fallout 4 is that their worlds are alive and complex to the point of near-total unpredictability. Everything—landmarks, enemies, conversations, treasures—is laid out the same way for everyone, but there are so many other variables in motion at any given time that it’s possible, if not likely, that no two people will experience a specific event in the exact same way. It’s why talking about these games is so much fun. It’s possible to see things and live things in ways that no one else ever will, and racking up tons of those unique personal stories, whether they are spectacular or more intimate and profound, is inevitable. Now, since I know plenty of you Gameologinites out there have already dipped your toes into Fallout 4’s deep, deep waters, I was thinking this would be the perfect place for a little story-swapping session. I’ll lead off with one of the more random and wild situations I’ve found myself in so far. “What combat?” I thought, and just as I turned around to look for whatever unseen annoyance was throwing off my plans, a 15-foot-tall crab monster erupted from the pond next to me. Now at this point, I’d played the game for around 60 hours, and my arsenal is strong enough to handle just about anything—but this thing? This thing was some heinous, unrelenting force capable of spitting powerful acid straight at your face from dozens of feet away. So I started backpedaling, alternating between unloading my rifle into its gut and sticking myself with Stimpacks to hold off the corrosion. It seemed like a silly war of attrition. This thing would not let up and that acid could completely melt me away in a matter of seconds, but if I just kept healing and shooting, eventually this beast would go down. That was the plan, anyway. As I ran backward, I must have stumbled into some abandoned military outpost, because the next thing I knew, some beefy robot guard was proclaiming me an intruder and firing lasers at my face. Sandwiched between these two death-dealers, I decided it was finally time to just forget shooting and get the hell out of there. I holstered my gun and headed for the treeline, leaving the near-dead crab beast and my new robot friend in the dust. That’s when I realized I was no longer under fire, but I could still hear the robot spouting its mid-combat catchphrases. So I turned around just in time to see my pursuers taking it to each other—giant killer crustacean versus badass murder-bot. The fight didn’t last long, but it’s a good thing I’d already softened up that crab. Right after it landed the death blow on the sentry bot, the valiant machine self-destructed in an explosion of flames and electricity powerful enough to take the monster down with it. I shook off my awe and did what any sensible wasteland adventurer would do in that situation: waltz over to the remains of these two magnificent beings and gather up whatever useless crap was left on their carcasses. More mirelurk meat for me. Well, that’s one of my favorite stories from The Commonwealth. If you’ve been playing Fallout 4 and have a tale you’d like to tell, why not share it down in the comments? And if not, the question still stands: What are you playing this weekend?